Heineken USA is running “Departure Roulette”, an advertising campaign promoting the #Dropped webisode series with a stunt in John F. Kennedy airport in New York. Travelers between the ages of 25 and 40 in Terminal 8 were given the opportunity to exchange their travel plans for a trip to a randomly chosen international location. 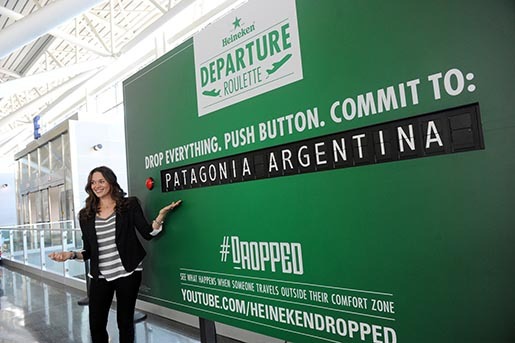 Those who won the hourly random drawing pressed a red button the Heineken billboard before being sent to locations such as Morocco, Laos, Thailand and Cyprus, with two free hotel nights and $2000 for expenses. The Departure Roulette campaign was developed at Wieden + Kennedy, New York, by executive creative directors Eric Quennoy, Scott Vitrone, Ian Reichenthal, Mark Bernath, creative directors Erik Norin, Eric Steele, copywriter Will Binder, art director Jared White, executive producer Nick Setounski, interactive producer Victoria Krueger, assistant producer Kristen Johnson, account team Patrick Cahill, Jacqueline Ventura, Sydney Lopes, social strategist Jessica Abercrombie, project manager Rayna Lucier, senior community manager Mike Vitiello, director of interactive production Brandon Kaplan, head of integrated production Lora Schulson, business affairs team Sara Jagielski, Lisa Quintela, Quentin Perry, global travel director Colleen Baker, lead/senior travel consultant Angela Wootan, senior travel consultant Joelle Wainwright. Filming was shot by director Dan Levin at Legs Media, with BrehmLab editor/colourist Fred T. Brehm, Ian Park, Gabriela Tessitore, colourist M. Scott Vogel. Sound was designed by Eric Hoffman. The information display system was produced at designed and built at The Guild and fabricated at Solari Corp.